The Love Caribbean Cremation Urn is handcrafted from Caribbean Rosewood with great care. 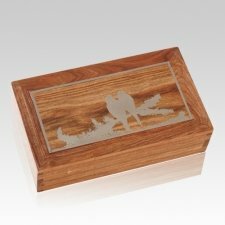 The urn features a peaceful image of love birds etched into the surface of the wood, then inlaid with a silver-based metal. The hand-rubbed wax finish will preserve the beauty of this stunning urn for many years. The intricate design and meticulous attention to detail will make this elegant work of art a treasured heirloom for generations to come.